Cliff Electronic Components is a leader in the design, development, manufacture and supply of components and connectors. We serve a range of markets and industries including Audio, Engineering, Instrumentation, Medical, Lighting and Vending. Cliff™ Incorporated serves customers throughout the USA, South America and Canada. We are a division of Cliff Electronic Components Ltd. (UK). Cliff™ Electronic Components Limited was founded in 1977 to supply the music industry with connectors. We have greatly expanded our products and services to become a high quality supplier to most professional and industrial markets. As both a manufacturer and a distributor, the expansion of our product range has established us as a prime source for components. From audio into test leads and accessories, general industrial connectors, foot pedals, hand tools, production aids, lighting connectors, motors and fans. We also manufacture and source various types of leads including audio, instrument and power leads. To further compliment our range, we provide expertise expertize in moulding molding and metalwork to provide a design, engineering and manufacturing service for the production of customised customized components and assemblies. Our plastics expertise expertize includes injection-moulding, injection-molding, blow-moulding, blow-molding, extrusion, sonic-welding and printing. Metalwork includes stamping, machining, aluminium aluminum extrusion, finishing and printing. We also have the facility to enable assembly, inspection and testing. Our UK and Far Eastern production plants are certified to ISO 9001 and employ design, engineering, technical, marketing and sales personnel. Quality has always been of prime importance and the majority of Cliff™ products are covered by approvals from organisations organizations such as UL, CSA, VDE, BEAB and JEAML (DENAN). UK, Europe and world-wide sales Sales are either direct to OEM’s or through a network of our distributors. Our business partners carry an extensive stock of components and provide a high level of technical and sales support. Cliff™ Inc. (USA) Having covered the American market via distribution since 1990, Cliff Incorporated was formed in 2007 to provide a better service for direct sales to the USA, South America and Canada. 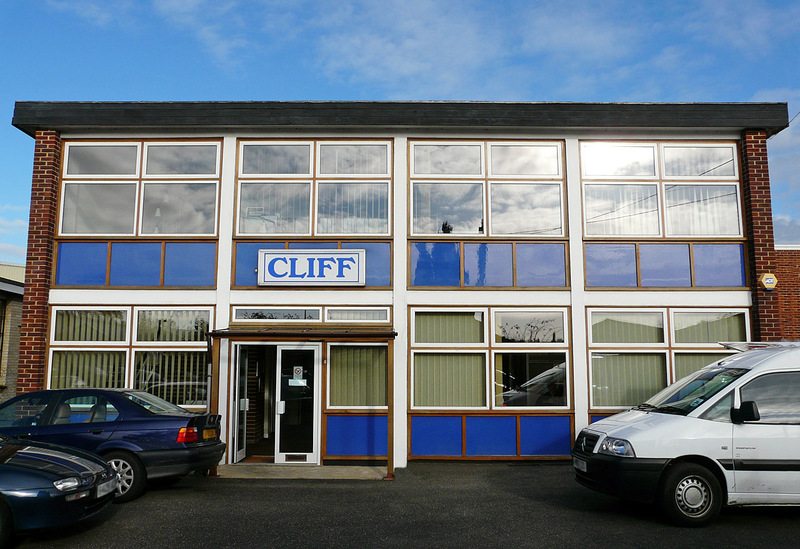 Cliff™ Electronic Components Ltd. Our international head office based in the United Kingdom. Cliff™ Enterprise Taiwan was set up in 2000 as a purchasing and liaison office but is now responsible for sales to the Far East. Cliff™ Components Technology (SZ) Co., Ltd. and Cliff™ Components Technology Manufacturing (DG) Co., Ltd. are our factory companies in China. BFA®, Cliff®, C ®, CliffCon®, Contractor®, Optifade® and StackJack™ are our Trade Marks. Cliff™ Electronic Components is a UK registered limited company: 01332056 with a V.A.T. registration number of: GB 219 8454 38. NAMM, the National Association of Music Merchants, has evolved from a national entity representing the interests of music product retailers to an international association including commercial, reseller members, affiliates and manufacturers. The NAMM Show is one of the largest music product trade shows in the world, held every January at the Anaheim Convention Center, California, USA. PLASA, the Professional Lighting And Sound Association is a UK-based trade organisation and qualifications authority. It is responsible for two of the industry-leading magazines, Lighting and Sound International and Lighting and Sound America. It organises one of the main European exhibitions for the sector, the PLASA Show in London's Earls Court. Please see our PLASA certificate (opens in a new window). ITSA, Interconnect Technology Suppliers Association. Providing networking forums for discussions, statistical data and business opportunities for the success of its members and the industry. ITSA has a presence on certain standards bodies. Formerly the British Connector Manufacturers Association (BCMA). Cliff™ has been assessed and certified, (GB92/939), by SGS on behalf of UKAS, as meeting the requirements of ISO9001 for the design, manufacture and marketing of electronic and electromechanical components, tools and cable assemblies. Please see our ISO 9001 certificate (opens in a new window). The ISO 9001 Quality Management System certification demonstrates our commitment to quality and customer satisfaction. It is based on customer focus, leadership, involvement of people, process approach, system approach, continual improvement, fact based decision making and mutually beneficial supplier relationships. None of Cliff™'s products or packaging contain Substances of Very High Concern (SVHC) on the REACH candidate list, in a concentration above the allowable limit. Please see our REACH compliance certificate (opens in a new window). Registration, Evaluation, Authorisation and Restriction of Chemicals (REACH) is a European Union regulation that addresses the production and use of chemical substances and their potential impacts on human health and the environment. It is administered by the European Chemicals Agency (ECHA). All parts manufactured by Cliff™ are in compliance with the restriction of the use of certain hazardous substances in electrical and electronic equipment, (directive EU RoHS 2015/863 of the European Parliament). Please see our RoHS compliance certificate (opens in a new window). The RoHS directive restricts the use of certain hazardous materials in the manufacture of various types of electronic and electrical equipment. Cliff™ are pleased to support the RMI Responsible Minerals Initiative helping companies make informed choices about responsibly sourced minerals in their supply chains. Please see our CMRT Conflict Minerals Reporting Template (opens in a new window). The CMRT details sourcing information on any tin, tantalum, tungsten and gold used in our products. Our company name comes from the fact that the original factory was located at Telscombe cliffs, just 100m from the English channel.